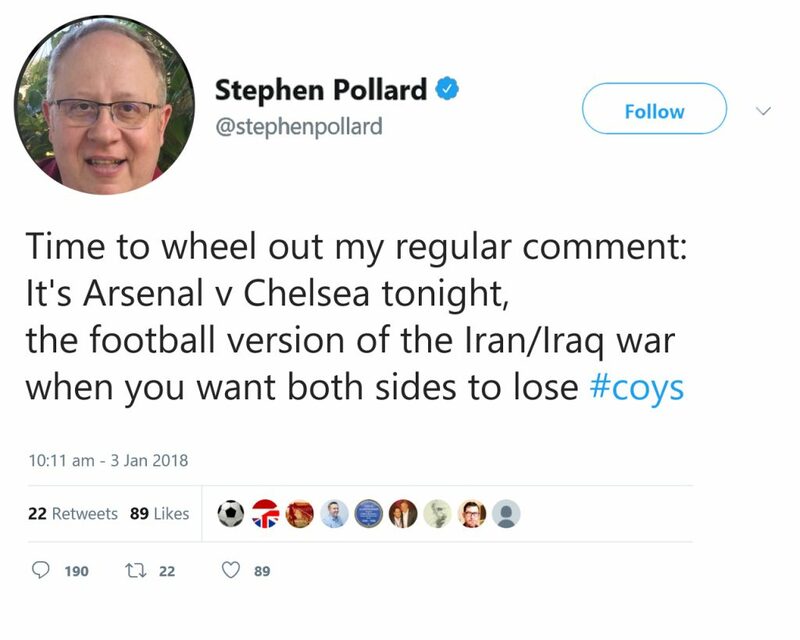 Stephen Pollard is accused of inciting hatred and bigotry following a tweet in which the staunch Tottenham Hotspur fan compared a match between Chelsea and Arsenal to the war between Iran and Iraq because he wanted both sides to lose. Other Twitter users condemned Pollard for his remarks about a war in which more than a million people were killed.“I wonder what your reaction would of [sic] been if someone made football related jokes about the Holocaust!” one furious twitter user responded. Others described the comment as “vile” and “disgusting”. Many branded his tweet Islamophobic. “You despicable man. A million people died & you make fun of them? Is this implicit #Islamophobia coming out? If someone had made such a hideous analogy with Israel etc you’d be crying antisemitism. Truly hideous man”. “His hate and contempt for Arabs and Muslims are so obvious. And this is the editor of a major Jewish paper!” wrote another angry user.